Western Cape Travel Guide / If the Western Cape were a woman, she would turn heads. As a province of South Africa, the Western Cape draws millions of visitors each year to a seemingly small area if compared with other provinces in South Africa, but one that is so beautiful that it can’t help the distinct attention it draws. 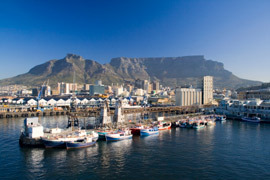 Affixed to the tip of Africa as it is, the Western Cape lies bordered by two oceans – the Indian Ocean to the south and the Atlantic to the west – which goes a long way to clarify its allure. The wild Cape Agulhas coast, the extraordinary magnificence of the Garden Route, the sparse, sweeping stretches of sand, punctuated only by rocky outcrops and fishing villages, of the West Coast notwithstanding, it is not the coastline alone that draws the crowds. The constant reassuring presence of immense peaks form the backdrop to a land so lovely in parts that the emerald lakes and indigenous forests of the Wilderness, the sun-drenched vineyards of the Cape Winelands, the magnificent passes to reach the interior and the wide, windswept arid spaces of the Klein Karoo seem part of a fantasy landscape that often defies description.